Andrea, G. D., et.al. Cervical Vagal Schwannoma, Review of all Reported Cases and Our Reports. (2016) Int J Neurol Brain Disord 3(2): 1- 6. © 2016 . This is an Open access article distributed under the terms of Creative Commons Attribution 4.0 International License. Intradural spinal lipomas not associated with congenital dysraphism and malformations, are rare and benign slow growing tumors, representing about 1% of all spinal tumors. 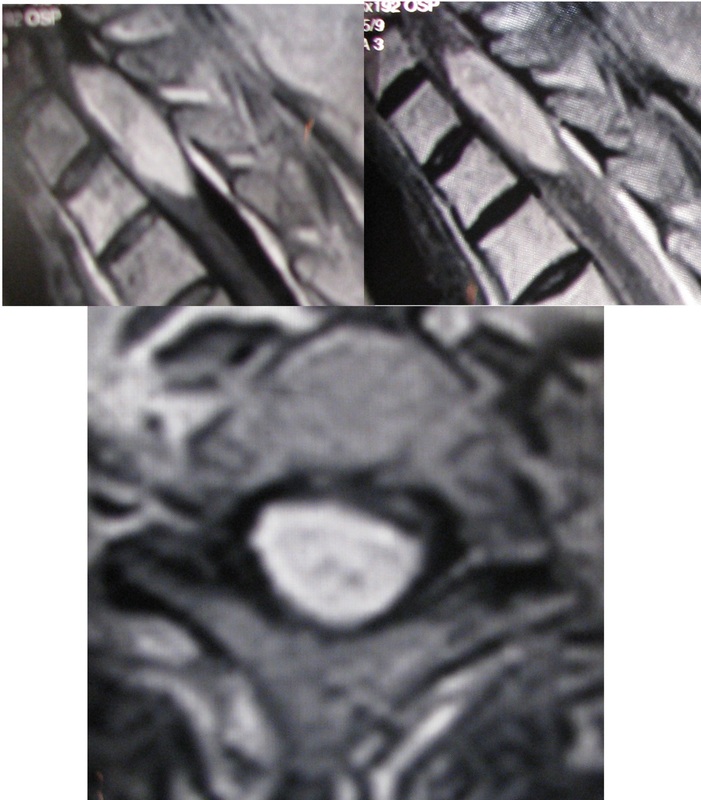 We report two cases both of a 59 years-old women complaining of gait difficulties, progressive para-paresis and long history of back pain with a magnetic resonance imaging suggestive for a subpial spinal lipoma with compression of posterior aspect of spinal cord from T1 to T3 and cono-cauda. The aim of this paper is to illustrate the technique of resection of this type of lesions and to emphasize the role of intraoperative neurophysiological monitoring in order to perform a safer surgery and to objectively establish its end with an extensive review of the literature focused on this aspect. Intradural spinal lipomas not associated with congenital dysraphism and malformation[1-5] are rare and benign slow growing tumors, representing about 1% of all spinal tumors[1,2,3,5,6,7]. They can be classified according to their relation with the spinal cord into two subgroups: the intramedullar group and the subpial group. Such neoplasm’s usually have not an identifiable cleavage with medulla and, moreover, they occur at the thoracic or cervico-thoracic level[1,3,5,7], where the thoracic spine is the most involved segment. In this case surgery is not oriented towards total removal; instead, the main goal is the debulking for medullar decompression[1,7]. However, analyzing the literature[1-34] it can be noticed a variability of surgical strategies, ranging from few cases of complete removal to biopsy with various rate of decompression[1,3]; that are mainly settled on subjective neurosurgeon’s experience and decision. Our aim is to review extensively the literature adding a case of subpial thoracic lipoma; plus we would like to emphasize the mandatory role of intraoperative neurophysiological monitoring (IOM) in order to perform a safer surgery and to objectively establish its end. IOM has been reported only in few cases[4,5] but we believe it is mandatory, since it constitutes an objective parameter to control surgery and to reduce postoperative deficits. Figure 1: MRI demonstrates an intradural extramedullary lesion compressing the posterior section of the medulla from D1 to D3. The mass is hyperintense both on T1- and T2-weighted images and did not show significant enhancement after gadolinium administration. Figure 3: We performed a generous removal of about 70 - 80%, rigorously following the intraoperative neurophysiological monitoring. During surgery our neurophysiologist monitored SEPs, transcranial MEPs and free run EMG (Figure 4 and Figure 5). We performed a peripheral stimulation of tibialis nerve (intensity 20 - 40 mA, duration 0,2 ms) recording from the scalp by means of platinum iridium needle electrodes (length 12 mm, diameter 0,40 mm, cable length 1,5 m); at the same time we valuated transcranial MEPs (intensity 200 - 300 volts duration 0,2 ms) by a train of 5 stimuli (200 - 300 volts, rate 4 ms).The change of the neurophysiological parameters was the main element to define our surgical end point. In particular we evaluated the modification of the amplitude of SEPs (from bilateral stimulation of tibial nerve) and we considered an amplitude reduction of transcarnial MEP of 40% as a “stop-surgery parameter”. The post-operative course was uneventful with no post-operative deficit and the patient was discharged after 10 days. After 2 years, the patient showed a great improvement of her paraparesis, hyperreflexia and back pain. The histological exam confirmed the diagnosis of lipoma. Figure 6: Sagittal MRI showing the cono-cauda lipoma. The mass was only partially resected following the intra-operative monitoring data and the not well defined borders (despite the use of the operative microscope) of the lesion at the lower edge of the conus and cauda. The postoperative course was uneventful with improving of her deambulation and paresthesia. 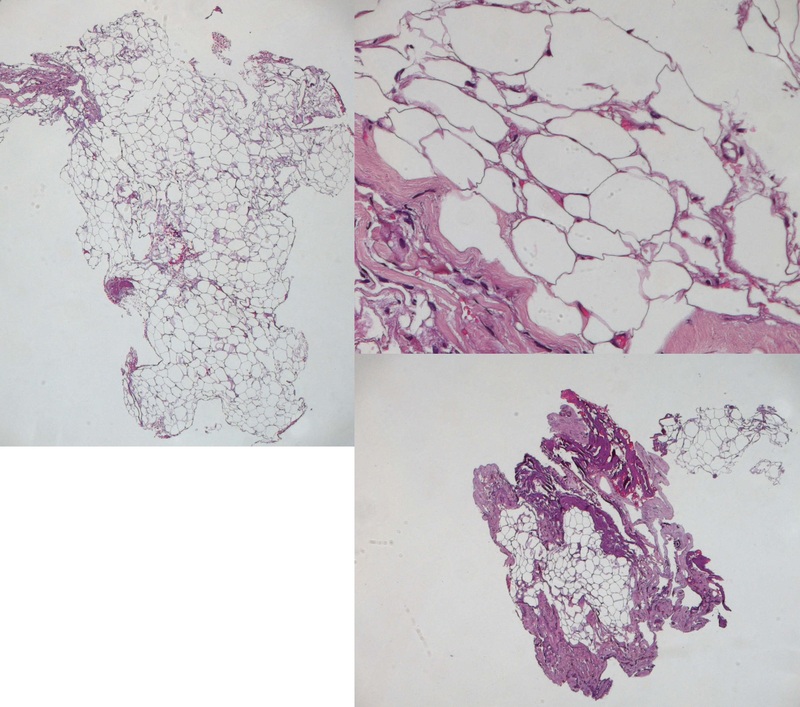 Histological examination confirmed the diagnosis of subpial lipoma. Gower was the first to report in 1876 a case of spinal lipoma without spina bifida in a 54 years old man, even though it was a necropsy. We widely revised literature from 1876 up today to report the described cases of subpial lipomas without congenital dysraphism and malformation, vertebral and dermal abnormalities and intracranial extension.Intramedullary cases and necropsies were also excluded from our revision. We found 43 cases in literature corresponding to subpial lipomas and inclusion criteria, as we report in (Table 1). The diagnosis of spinal subpial lipoma without congenital dysraphism is rare[1-5]; these lesions are termed as “true lipomas”[10,11] and occur mainly at the thoracic level, followed by cervico-thoracic segment and then cervical spine[1,4]. Such tumors are slow growing benign tumors representing about 1% of all spinal tumors[1,3,5,6,7,11,12,13,14]. Gender does not appear to affect such lesions[4-6,15] even if Bekar et al report a slight male preponderance, while our review demonstrated a slight female preponderance. Lipomas are histologically identical to normal fat and it is supposed that a developmental alteration of neural tube’s formation could produce the inclusion of embryonic crest of fat cells; but their pathogenesis is still unclear[2,6,10,16]. This tumor contains fat with a metabolic activity similar to adipose tissue so that some Authors suggested an aggressive weight loss as therapy. Lipomas could enlarge during period of relevant weight increase or for steroid administration. Even if they are considered microscopically benign lesions or hamartomas, lipomas behave as tumors with a thin capsule with a cleavage at the tips of the lesion, that becomes indistinct and firmly attached to neural tissue along the lesion[3,4]. The connection of the tumor with nerve roots suggests a secondary entrapment of them within the lesion. Usually subpial lipomas determine an ascending spastic paresis and not radicular but localized pain over the involved segment[3,4]. Radicular disturbances do not often occur, while back pain is usually reported. Affected patients usually report a long duration of clinical symptomatology[1,6,17] with a slow deterioration of their neurological status. Fujiwara et al reported a rapid deterioration of symptoms during pregnancy and Giuffrè had previously stated that onset of symptoms can occur during pregnancy. CT scan could supply the diagnosis relating to the very low density of fat[3,5,6,7,9,10] but the exam of choice is MRI. CT scan can identify the tumor and define its extension; but MRI ensures a detailed study of the spinal cord and canal[2,10]. Lipomas produces a characteristic hyper intense signal on T1 weighted images and a more variable signal, hypo intense, isointense, or hyper intense, on T2 weighted images[2,3,4,5]; while the lesion does not change after contrast medium administration. Intradural spinal lipomas can be classified according to their relation with the spinal cord into two subgroups: the intramedullar and the subpial groups. Such lesions show an extramedullary (40%) or intradurally (60%) position; however, when these tumors lay on the cord they are so firmly attached to it that they resemble an intramedullary lesion. Ehni and Love described these lesions as having a layer of connective tissue separating the fat from the cord; and they strongly supported the conviction of their pial origin. Intradural lipomas have been differentiated in intramedullary lipomas, showing only their exophitic portion, and completely subpial ones. Spinal lipoma appears intraoperatively as a soft and yellow fusiform mass usually with a clear cleavage only at its margins; but such neoplasms have not an identifiable cleavage with medulla[6,7]. Spinal cord tissue entirely covers the intramedullary lipomas, since the lesion grows inside the medulla, enlarging it; approaching such lesions requires a myelotomy even if a subgroup of them presents an important exophitic component. Subpial lipomas are wrapped into a thin membrane continuing with the pia mater and show a cleavage plane between their poles and medulla that rapidly disappears. Spinal cord is able to tolerate this adipose tumor as long as its pressure or interference with blood supply becomes critical, leading to neural degeneration. Therapeutic strategy could vary; conservative options as dietetic control or simple biopsy have been described along with more invasive behaviors, such as partial or subtotal aggressive removal[1,15]. Actually total removal is not advisable because of the high associated postoperative morbidity[1,3,10]. 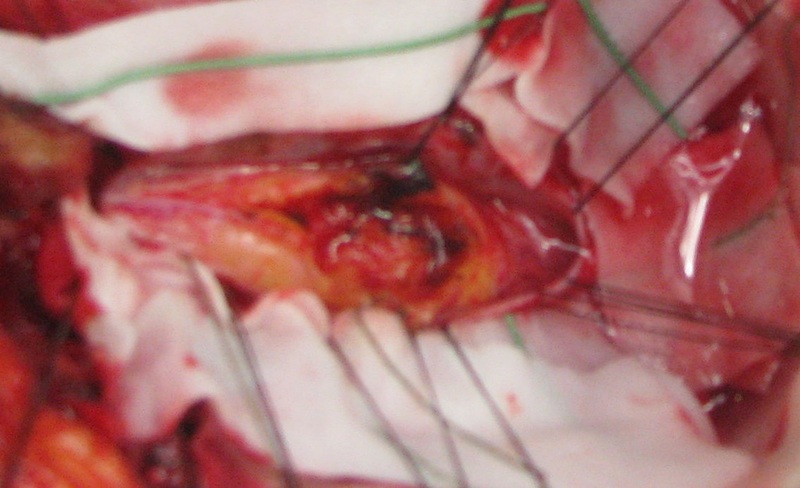 Even if lipomas are located in the conus-epiconus, aggressive surgery should not be attempted: in fact lipomas show tenacious adhesion with nerves and medulla, therefore surgical strategy is only untethering and decompression. Surgery is usually achieved with the help of an operating microscope with ultrasonic aspirator and laser; and, in our opinion, intraoperative neurophysiological monitoring is mandatory. The main goals of surgery are to stop the progression of symptoms and to decompress the neural tissue while the complete removal, as previously said, is not recommended[2,4,5,20]. Many Authors[2,6,11] believe that asymptomatic spinal intradural lipomas should not be operated on. It is surprising that among 43 cases, 26 of whom after the seventies, only in 2 Authors[4,5] report an intraoperative neurophysiological monitoring during surgery. 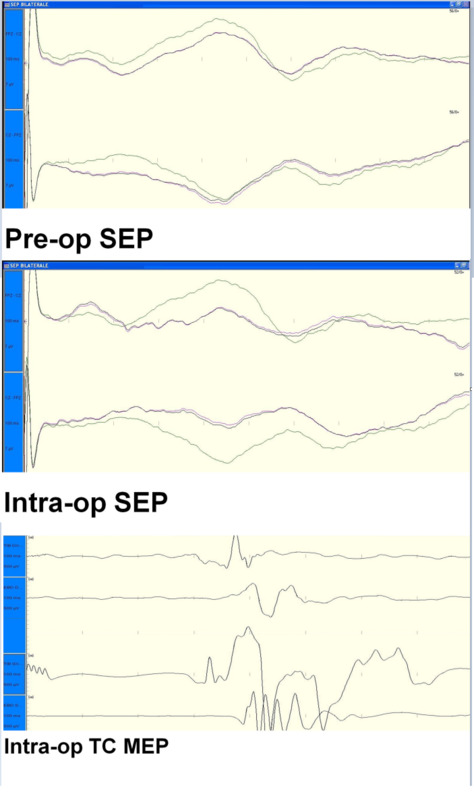 Yamashita et al report the use of SEPs for intraoperative neurophysiological monitoring to evaluate whether decompression was accomplished. Besides, literature clearly shows[1-7,9-28,30-34] the lack of uniformity regarding the best surgical strategy: the range goes from no removal or biopsy (4,6%, 9,3%) to partial, subtotal or total removal (46,5%, 25,6%, 14,0%). We do believe that intraoperative neurophysiological monitoring has to give to the neurosurgeon objective criteria of ending his debulking; and, precisely, we stop the procedure when SEPs become lower than 40%. So, once again we want to remark that in our opinion intraoperative neurophysiological monitoring is mandatory and SEPs should always be evaluated; but the contemporary setting of electrical transcranial MEPs (TMS) gives to the neurosurgeon a higher degree of confidence about postoperative motor outcome, especially when variations of SEPs have been recorded. A significant modification of transcranial MEP’s amplitude and/or lengthening of P40 and/or SEP latency must lead the neurosurgeon to end removal. We use TMSs and SEPs at the same time for a better clinical interpretation of their intraoperative variations; an intraoperative decrease of SEPs without TMS variations testifies a good postoperative course. 1. Bekar, A., Sahin, S., Taskapiloglu, O., et al. Intradural spinal lipoma: report of a thoracic case and a lumbar case. (2004) Turkish Neurosurgery 14(1-2): 52-56. 2. Falavigna, A., Segatto, A.C., Salgado, K. A rare case of intramedullary lipoma associated with cyst. (2001) Arq Neuropsiquiatr 59(1): 112-115. 3. Fujiwara, F., Tamaki, N., Nagashima, T., et al. Intradural spinal lipomas not associated with spinal dysraphism: a report of four cases. (1995) Neurosurgery 37(6): 1212-1215. 4. Iwatsuki, K. Intradural cervical lipoma with parenchymal marginal fibrous tissue: case report. (2006) Neurosurgery 59(1): E208. 5. Yamashita, K., Yonekawa, Y., Kawano, T., et al. High cervical intradural lipoma-case report. (1992) Neurol Med Chir (Tokyo) 32(5): 285-288. 6. El-Khamlichi, A., El-Ouahabi, A., Amrani, F., et al. Spinal cord lipoma. Apropos of 3 cases. (1989) Neurochirurgie 35(6): 366-370. 7. Sugawara, A., Kim., K, Isobe, M., et al. 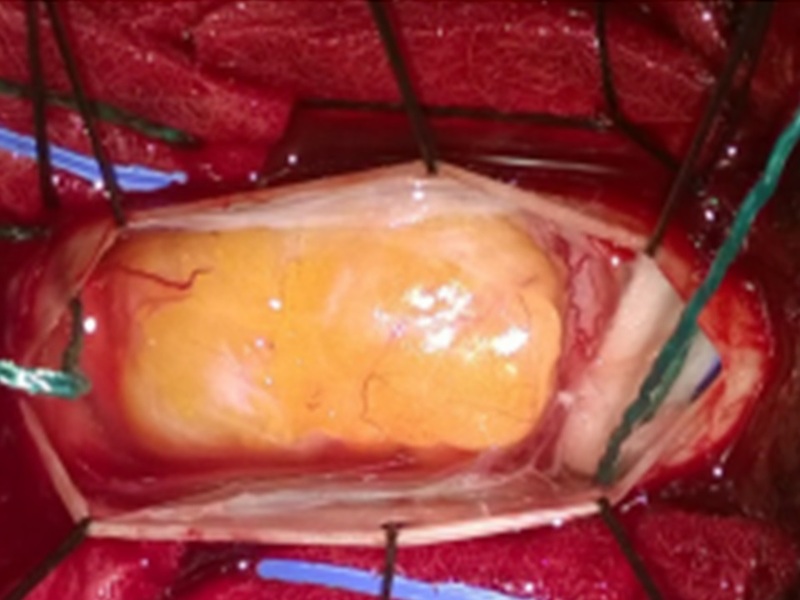 Surgical treatment of spinal lipoma without spina bifida at lumbar region-three case reports. (2009) Neurol Med Chir (Tokyo) 49(12): 616-618. 8. Arsenjo, A., Contreras, M., Espinoza, J. Lipomas intraspinales. (1945) Arch Soc Cir Hosp 15: 773-779. 9. 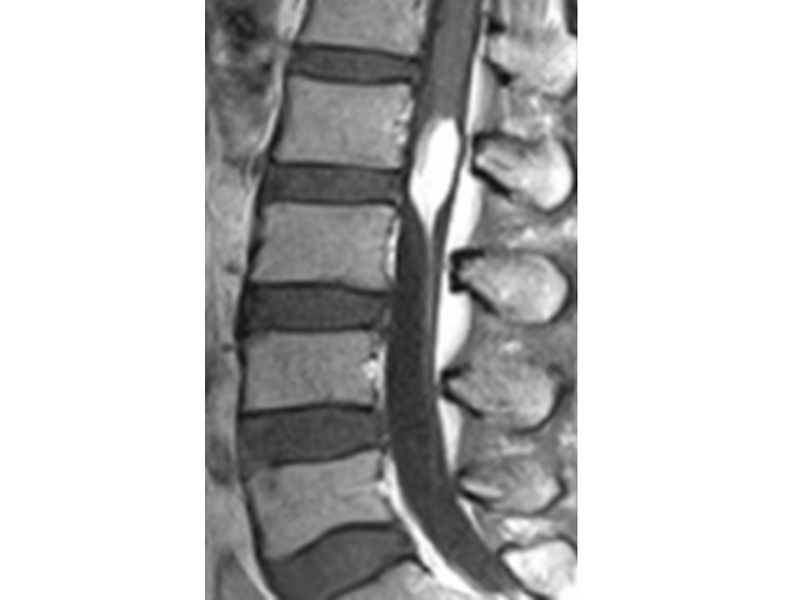 Gowers, W.R. Myolipoma of the spinal cord. (1876) Trans Patol Soc 27: 19-22. 10. Lunardi, P., Missori, P., Ferrante, L., et al. Long-term results of surgical treatment of spinal lipomas. Report of 18 cases. (1990) Acta Neurochir (Wien) 104(1-2): 64-68. 11. Foster, J.J. Spinal intradural lipomas. A neurosurgical dilemma. (1966) Int Surg 46(5): 480-486. 12. Giuffre, R. Intradural spinal lipomas. Review of the literature (99 cases) and report of an additional case. (1966) Acta Neurochir (Wien) 14(1): 69-95. 13. Johnson, R.E., Roberson, G.H. Subpial lipoma of the spinal cord. (1974) Radiology 111(1): 121-125. 14. Wood, B.P., Harwood-Nash, D.C., Berger, P., et al. Intradural spinal lipoma of the cervical cord. (1985) AJR Am J Roentgenol 145(1): 174-176. 15. Dyck, P. Intramedullary lipoma. Diagnosis and treatment. (1992) Spine 17(8): 979-981. 16. Caram, P.C., Carton, C.A., Scarcella, G. Intradural lipomas of the spinal cord; with particular emphasis on the intramedullary lipomas. (1957) J Neurosurg 14(1): 28-42. 17. Elsberg, C.A. Tumors of the spinal cord and the symptoms of the irritation and compression of the spinal cord and nerve roots: pathology, symptomatology, diagnosis and treatment. (1925) Paul B Hoeber New York. 18. Sanh, A.M., Türkoğlu, E., Kahveci, R., et al. Intradural lipoma of the cervicothoracic spinal cord with intracranial extension. (2010) Childs Nerv Syst 26(6): 847-852. 19. Ehni, G.T., Love, J.G. Intraspinal lipomas. Report of cases; review of the literature, and clinical and pathologic study. (1945) Arch Neurol Psychiatry 53(1): 1-28. 20. McGillicuddy, G.T., Shucart, W., Kwan, E.S. Intradural spinal lipomas. (1987) Neurosurgery 21(3): 343-346. 21. Bianchi, M., Frera, C. Lipomi spinali. (1958) Minerva Neurochir 2(2): 67-72. 22. Crosby, R.M., Wagner, J.A., Nichols, P. Intradural lipoma of the spinal cord. (1953) J Neurosurgery 10: 81-86. 23. Fay, T. Vasomotor and pilomotor manifestations: their localizing value in tumors and lesions of the spinal cord; a report of thirteen verified cases. (1928) Arch Neurol Psychiat 19: 31-46. 24. Gross, S.W. Lipoma of the spinal cord simulating degenerative disease. (1958) Am J Surg 96(3): 462-464. 25. Hoffmann, G., Warot, P., Galibert, P., et al. Intramedullary lipomas of the cervicodorsal region. (1960) Rev Neurol 103: 558-567. 26. Huda, M.F., Mohanty, S., Sharma, V., et al. Subpial lipoma of the spinal cord. (2003) Indian J Radiol Imaging 13(4): 423-426. 27. Kernohan, J.W., Woltman, H.W., Adson, A.W. Intramedullary tumors of the spinal cord: a review of fifty-one cases, with an attempt at histologic classification. (1931) Arch Neurol Psychiat 25(4): 679-701. 28. McGillicuddy, G.T., Shucart, W., Kwan, E.S. Intradural spinal lipomas. (1987) Neurosurgery 21(3): 343-346. 29. Ehni, G.T., Pugh, D.G. Intraspinal lipoma. (1944) Proc Staff Meet Mayo Clin 19: 513-515. 30. Robineau, M. Diagnostic et traitement des tumeurs de la moelle. (1932) IX Congrès de la Soc. Int. De Chirurgie, Madrid 15-18 mars. Rapports, Procès-verbaux et Discussion, Imprimerie Medicale et Scientifique – Bruxelles (2): 575-662. 31. Root, E.F. Lipoma of the spinal cord. (1906) Utah Med J 40-42. 32. Sachs, E., Fincher, E.F. Intramedullary lipoma of the spinal cord: complete operative removal. (1928) Arch Surg 17(5): 829-833. 33. Singh, A., Gupta, V., Singh, H., et al. Nondysraphic intradural spinal lipoma. (2009) J Pediatr Neurosci 4(1): 55-56. 34. Slooff, J.L., Kernohan, J.W., McCarty, C.S. Primary intramedullary tumors of the spinal cord and filum terminale. (1964) Philadelphia-London: WB Saunders Co.